The aim of this article is to draw attention to numerous historical court files kept in the archives. In addition to the information related directly to the lawsuits, those documents may also contain different kind of evidence valuable for other disciplines than the history of law. 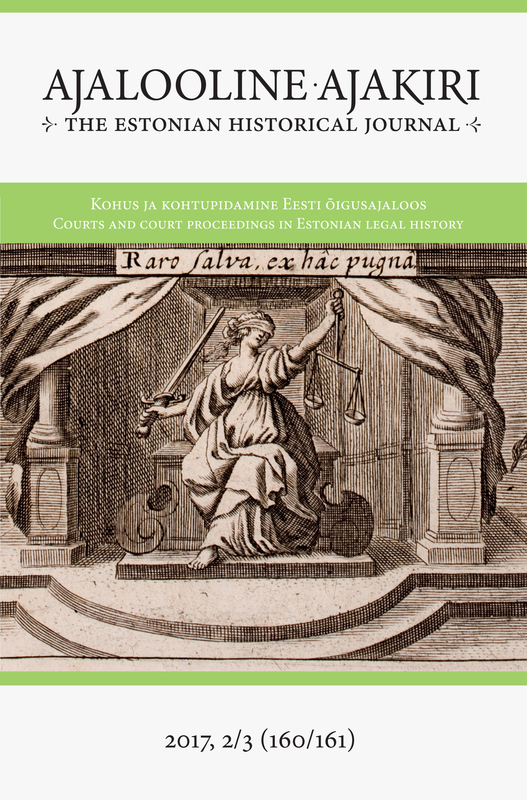 This case study focuses on the materials of a singular court case at the higher regional court (Oberlandgericht) of the province of Estland: the noble family Romanowitz sued 1667 Christoph Otto Grewe for conceiving their relative Anna Catharina Romanowitz sub spe matrimonii and demanded that those two should marry. Grewe was found guilty, and had either to marry Anna Catharina Romanowitz or to pay damages. We have no information whether they eventually married or not. Why does this particular seventeenth-century court fi le stand out? At first, it contains a handwritten poem dedicated to the name day of Anna Catharina Romanowitz – despite of its contemporary popularity there are only few seventeenth-century handwritten occasional poems left in the Estonian archives. Second, there are two letters of Grewe which may be interpreted as personal love letters or at least as highly flattering ones – again, there are not many of them preserved. Third, there is a letter from Anna Catharina Romanowitz, which is a rare case of a personal letter written by a noble woman. Fourth, letters written by the lawyers of both party and addressed to the court contain information about the reception of non-juridical literature, such as Roman authors Terence and Ovid, and highly popular novels, namely the medieval chivalric novel Amadis de Gaula and the pastoral novel The Countess of Pembroke’s Arcadia of Philip Sidney. Fifth, the letters of the lawyers may contain an early hint that the controversial work of René Descartes, Principia philosophiae, might have been known in province Estland in 1667. Sixth, these letters contain hints to several school disciplines, such as rhetoric and poetics, logic and philosophy. And seventh, most of the documents in this court file confirm and complement our knowledge about the general educational level of different social classes (noble women, common men, lawyers).